I’ve written briefly about review articles in a previous article. Here’s what I said there. So just what does that mean, when you unpack its rather terse phrasing? For a start, it means that a good review article will tell you what the really important things are that you need to know about, and that you probably need to mention in your own literature review (the “key research developments” phrasing above). Sometimes you’ll need to use your judgment, and decide that one of those topics may be important in other parts of the field, but isn’t important in the part that you’re writing about. If you do that, then the smart tactic is to mention the topic in question, with a reference to the review article, and to explain briefly why you’re not going to explore it in detail. That way, you reassure your readers that yes, you know about the topic, and yes, you’ve made a deliberate decision not to go into detail about it. This is a particularly useful tactic if you’re writing your PhD thesis, since it shows the examiners that you know about the topics that you ought to know about. If you simply omitted any mention of the topic in question, then the examiners would assume that you did so because you’d never heard of it, which is not a signal that you want to send out. Knowing about the key topics is important. However, it’s also important to know what the key publications are which describe and discuss those topics. Review articles not only tell you what the key topics are; they also tell you what the key publications are that relate to those topics, so you can add those publications to your to-read list, with an inward sigh of relief that you won’t have to track them down for yourself. That’s an obvious advantage of review articles. A less obvious advantage is that they also tell you who the key players are in a given field. This is very useful for various reasons. One is for planning your networking and career plans. Once you know who the main players are in your area, you can start doing your homework about them, and deciding which of them you would really like to work with. You can then start building up your profile in a way that improves your chances of getting to work with them. Another reason that this knowledge is useful is that it helps you in your searches for more recent relevant publications that date from after the publication of the review article. If you know that Smith & Green are key players in your field, then you can search for their names in the relevant bibliographic database, or look at the “publications” part of their home pages on the Web, and see what they’ve published recently, so you’re up to date. One of the problems with wading through the literature article by article is that you often have trouble working out what the big picture is. Often, it’s because there are two or more rival approaches making contradictory claims. Sometimes, it’s because researchers are using two or more very similar-looking terms in a way that causes confusion (for instance, the two very different interpretations of the acronym NLP). A significant advantage of review articles is that they provide you with a clear, coherent overview. Also, the overview is likely to give a reasonably fair and balanced overview, since otherwise it wouldn’t have got past the reviewers and into print. You don’t have to agree with that overview, but the key point is that the overview will probably be reasonably coherent and clear, which is a good start. Review articles don’t just tell you what’s been written about a particular topic. They also usually tell you explicitly about what hasn’t been written. For aspiring researchers, this feature of review articles is a gold mine. You can read through review articles, spotting for gaps that they’ve identified, and that someone such as yourself could usefully investigate, with a good chance of publication at the end of the research (since your research would be plugging an established gap in the literature). This leads on to another good feature of review articles. Suppose that you have a wild hunch which came to you in a dream; suppose further that you spend a couple of years doing some expensive research to find out whether the hunch is right. Suppose that you discover that the hunch was totally wrong. What can you salvage from that wreckage? Probably, nothing. Usually if your hunch is wrong, you’re sunk, because the absence of what the hunch predicted is not a significant absence. It’s a very different story if you test out one of the claims made in a review article, and discover that the claim was wrong. In that case, the absence of a result will almost certainly be a significant absence, so you can write about the significant implications of this outcome, secure in the knowledge that you can blame the mistaken claim on the writer of the review article. One easy way of finding review articles is to go onto the appropriate bibliographic database, or Google Scholar if appropriate, and type in the search string “review article” in inverted commas, followed by the term that you’re interested in. 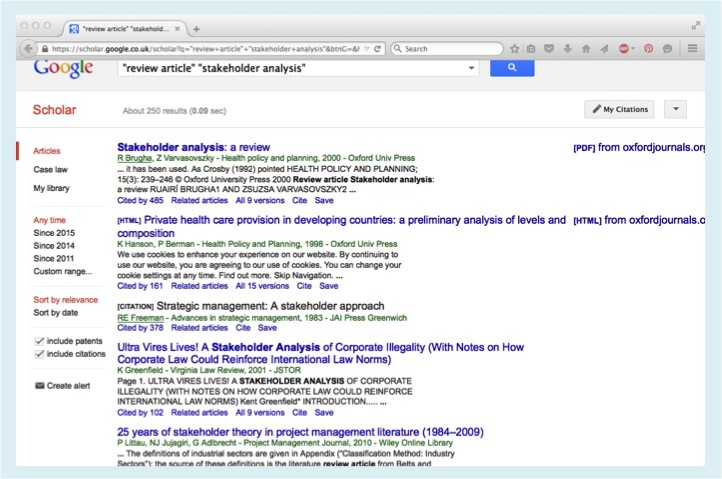 The image below shows a Google Scholar search for review articles about stakeholder analysis. I’ve put “stakeholder analysis” in inverted commas so that the search doesn’t produce millions of false positives from records that include mention of analysis but not of stakeholders. Here’s a close-up from the search above, showing the type of result that you can get with this sort of search. This particular example illustrates another neat feature of review articles. Usually, they include references to previous review articles, so once you’ve found one, you can use it to find a chain of others, which will in turn lead you to others, giving you a good guide to key reading for the last few decades. If you really get the hang of this, then a few hours of focused work can identify a batch of review articles that contain all the key concepts and references that you need for a substantial piece of research. (You’ll still need to find and read those other key articles that appear in the references of the review articles, but at least this way you’ll be focusing your reading on relevant articles, not wasting a lot of time reading things that turn out to be irrelevant). A closing thought for new researchers: Review articles aren’t “objective” or “unbiased”. Nothing is. Nothing can be. If you use those terms in something that you write, experienced researchers will probably view it as a sign of naivety. Good research takes account of this, and factors out a specified subset of potential problems via good research design. Here’s a brief example. Suppose you’re interested in gender stereotypes about risk. That topic is itself located within a framework of assumptions and world views, about what is worth researching and what isn’t, and about which values we can take for granted versus which beliefs are socially unacceptable. In that sense, it can’t be objective or unbiased. I’ve written about this, with particular reference to the concept of “objective facts” in a previous article; I’ll doubtless return to it in future articles. For the moment, though, I’ll focus on how research design interacts with social framing of research questions. There are a lot of obvious sources of potential distortion in the data that you might collect when investigating this topic. For instance, you’d probably get differences depending on whether the data collection was carried out by males or females, etc. However, you can neatly sidestep a lot of those issues by using the approach that one of my former students did for her undergraduate project. She gave participants a single sheet of paper which outlined a one-paragraph scenario. In the scenario, Chris had the choice between a safe investment which would probably produce a modest return, and a risky investment which might produce a high return, but which might be a complete loss. Everything else was identical for all the participants; only the perceived gender of Chris in the scenario was different, so any differences in results could only come from random chance or from the two wordings. Statistics allow you to work out how likely the “random chance” explanation is, giving you a nice, clean answer. And yes, in case you’re wondering, the advice that people gave male Chris was to go for the high risk investment, and the advice that people gave female Chris was to go for the nice, safe option. So, that’s how you can use review articles to get a swift, high-level overview of a field, including significant gaps and problems in that field which you can treat as opportunities. That’s also how you can reconcile human agendas in those reviews with research findings that are robust and more than just a matter of opinion. On which note, I’ll end. The next article in this mini-series will be about how to know when you can scale down your literature review. This entry was posted in hints and tips, research methods, tutorial, useful concepts and tagged bias, gender research, literature review, objectivity, review article by hydeandrugg. Bookmark the permalink.